It’s that time of year again, the nights are longer, the days are colder, and the Christmas menu returns to PizzaExpress on 22 November. It’s officially winter, and it’s time to start revelling in the festivities it has to offer. Christmas is a time of celebration, and we believe PizzaExpress is the perfect place to enjoy a special occasion with your loved ones. We’re sure you’ll find something to enjoy on the new menu. 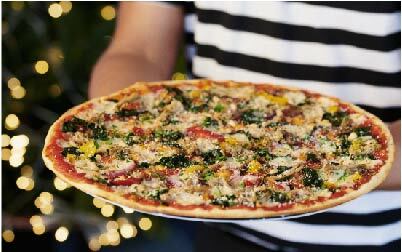 The La Festiva takes the highlights of a true Christmas dinner and puts them on a pizza as it features pulled turkey and delicious stuffing, we really can’t think of anything better. There’s also a range of festive starters, including PizzaExpress inspired pigs in blankets, which include seasoned pork meatballs wrapped in crispy pancetta. Of course to truly get into the spirit of things, you’ll need something sweet to finish off your meal. Their famous Snowball Dough Balls are back for another year, with every portion served with three delicious dips: salted caramel, fruit coulis, and vanilla cream! If you head over to your local PizzaExpress on 21 November you can pick up a portion of Snowball Dough Balls a day early for just £1, with all proceeds going straight to Macmillan Cancer Support. Get your family and friends together to book your table now at the Broad Street Plaza PizzaExpress and get into the Christmas spirit! Book now and view the full menu here.